In a direct collaboration with Lyft, Colossal covered Brooklyn walls with localized messaging designed to get people into cars using the ride-sharing app. Lyft’s objective was to paint the brand in a fun, bright, and creative light. The brand commissioned Noma Bar, an illustrator and graphic designer, to create the artwork for the campaign. The bold, simple treatments were a perfect match for Lyft’s look. By selecting seven of our largest, most impactful locations in Williamsburg, Lyft dominated the vibrant neighborhood with their colorful creative. With 12 years in Williamsburg under its belt, Colossal was invited to join a brainstorming session to come up with taglines that would speak to the locals. The final site-specific copy contained nods to hotspots surrounding each wall. Why walk when you can ride. When You Need to Go That Extra Mile. Shift from the Park to the Back Seat. Go From Rooftop to Ride Home in Minutes. Make an Exit After Encore with Lyft. Get Out of the Gutter and Into a Lyft. When you've had your fill, we've got your ride. The mural adjacent to the always-packed McCarren Park urged viewers to take a car home after a day in the sun. 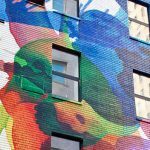 A mural along the Wythe Avenue corridor referenced the abundance of rooftop bars — Output, Berry Park, Northern Territory and The Wythe Hotel, to name a few. One unit made a pass at the dense smattering of music venues in the area, and another played off of its location steps away from both of the neighborhood’s bowling alleys, The Gutter and Brooklyn Bowl. A campaign-specific promotional code was added to each of the murals to measure the results. Lyft leveraged the content provided by the murals, extending campaign impressions by sharing behind-the-scenes photos with their 50,000 Instagram followers. The bright, graphic imagery acted as a magnet for smartphone photographers hunting for photo opps, and Pop Up City covered the campaign in an article hailing the advertisements as neighborhood-beautifying works of art.